The 2013 Redistribution Draft is now open. You have 3 weeks to make your selections (see the link on your team roster). Deadline is Sunday night 1/20/13 at midnight Pacific. New players are now in the BWB player list. Look for players marked as "added in January 2013." No further additions until after Opening Day. Carryover selections for 2013 are locked. Look for results to be posted by the end of Sunday, Dec. 30. Phase One Draft list is due Monday night, January 7 (midnight Pacific). We're now in the final week to make your carryover choices - the deadline is Sunday, Dec. 23. You may keep up to 28 players on your roster - everyone else will have to go into the free agent pool. You must have enough cash to pay for all the players now and this is all the cash you will get until Opening Day. And you must comply with all roster limits for salaries over 250. Just in time for the last week - if you've got more than one team you can check all your teams for errors in carryover selections. You can also find this link on the multiteam tools page. I think we're now final on the list of teams/owners coming back in 2013. Here's the current list of orphan teams that are available. Email us if you want to pick up one of these teams. Fall Trading Period #1 (Week 29) Transactions - Results posted. The 2nd trading period is now open with deadline Friday Dec. 7. Are you keeping your team(s) in 2013? Please visit your team roster pages or go here to indicate whether or not you're going to retain ownership of the team in 2013. Deadline is November 30 or your team will be classified an orphan team. Post-season Fall Trading - Now open - deadlines are Friday 11/23 and Friday 12/7. See the transaction schedule There is no salary component to these trades - the new owners will be fully liable for the 2013 salary that will be charged in December. You must be confirmed as returning with your team in order to play a role in a trade. Roster limits are not enforced now - including trades. When you cut down to 28 players, that will get all teams in line. 2013 Salaries: Final salaries are posted. All 2013 positions set. Some positions for minor leaguers were not final at the October 30 posting. You can also start picking your players to keep/cut. You can keep up to 28 on your roster. Final decisions are due December 23. 2013 Salaries: Preliminary Salaries Posted. The salaries are subject to premium increases and are not final. Final salaries are likely to be set just before Thanksgiving. 2013 Salary Cap is 42787, up from 41974 last year. New leagues get 43000. Check the team finances page to see the actual cash distributed to each league. All teams have received this cash. Benchwarmer Bash. Finals Complete - Games 1-7 posted. Congratulations to Jesse Roche winner of the 2012 Benchwarmer Bash with Crumpton Roches from the Winners Circle League. Greg Flees is the runner up with Wisconsin from Bleed Dodger Blue. Jesse is our first 2-time Bash winner. He won in 2011 with a different team. Jesse gets 2 free seasons in BWB - Greg gets 1 free season. Benchwarmer Bash. Semifinals Complete - Games 1-6 posted. Benchwarmer Bash. Quarterfinals - Complete - Games 1-7 posted. 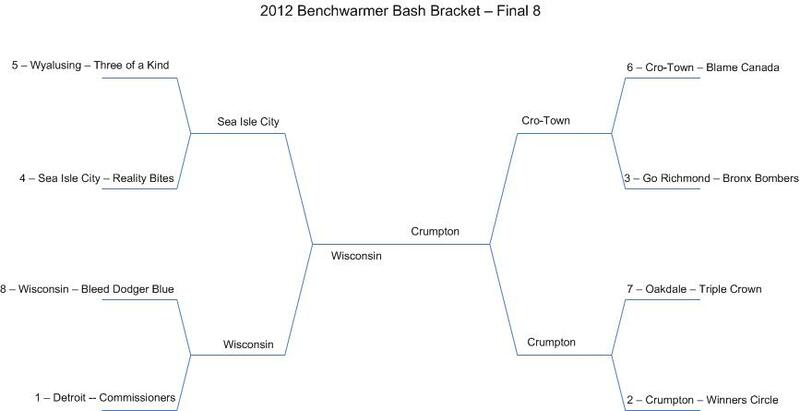 Eight Federation champions advance to the Quarterfinal round of the Benchwarmer Bash. The top seed advanced in 6 of the 8 Federations and we have the top 3 teams (out of 512) in Power Index represented. Benchwarmer Bash. Federation Finals Complete - Games 5-7 posted -- click on Federation Results links to see game scores. Benchwarmer Bash. League champions advance to fight it out to be the single winner for all of Benchwarmer Baseball. We start off with Federation Semifinals - Games 1-7 posted. 2012 Benchwarmer Playoffs Complete - Game 7 posted. Benchwarmer Bash for league champions begins with Federation play next week. Lineup changes, if desired, for the Bash are due TONIGHT at midnight Pacific. Players of the Year rankings are final for 2012. Benchwarmer Bash page is posted. We'll fill in details as teams qualify. NOTE: Only league champions will advance to the Bash in 2012 - there are no wild card teams. Tiebreakers for division ties and playoff matchups. Week 25 Statistics and Players of the Week. Players of the Year are not yet final rankings. Leucadia won season series 12-6. Leucadia won 4 of 6 games in the final three weeks. Crumpton won season series 11-7. Canadian took 4 of 6 in the final two weeks, including a sweep in games 148-150 to force the tie. Gotham City took 4 of 6 in final two weeks. Teams split 3-3 in the final three weeks. We have at least four divisions ending in ties (I'll check/post it later on Saturday night). Game 151 for division ties will get posted on Sunday. Week 25 Transactions - Results posted. Week 26 lineup deadline (week 1 of playoffs) is Friday night, October 5 at midnight Pacific. With 6 games to go: No teams have clinched division titles yet in either Murderers' Row or Superman League. Next game postings will be very late on Monday night. Three of a Kind - Connor Division: Damien Boys of Summer (owner Michael Quinn - 5th win in 2012) - Division features four teams all owned by guys named "Michael"
Before Saturday's games - Eight games remained in the regular season...57% of divisions were not yet clinched. Shadowball - Pittsburgh Crawfords Division: Cal Tech Atoms (owner Doug Schnack) - Wins league in even years - 2008, 2010….2012? Week 24 (Deadline Saturday night): This is the FINAL week for any free agent pickups. Week 25: Cuts and IR moves only. Playoff lineups: The "expanded rosters" of Weeks 23-25 no longer hold. Playoff results are dependent on the 26 active players. You must maintain normal roster limitations, so in some situations you might need to make room by cutting a player or putting one to IR if you want a minor-leaguer to be in your lineup or on your bench. Playoff results are calculated from random selections from the last half of the season (MLB games 81-160...up to 162 or beyond for pitching performances). Thanks for the response on the orphan blowout - all orphans are gone. Trades are closed for the 2012 season. Amazingly enough, some teams are close enough to division titles where we see magic numbers show up in the standings. It's possible one or two could clinch in Week 20. Major items to remember this week. We shift weekly transactions to SATURDAYS. August 25 marks the 2012 Season trade deadline. Contract Extensions closed for 2012. Remember - trades are not yet included in error-checking for cash or roster limits. Contract extensions - SUNDAY NIGHT (7/29) - Extended through Monday 7/30 7 PM Eastern. Some examples of good contract signings in 2011 and bad contract signings. Recently set - South Park Butters in Commissioners League (owned by Tom Twomey) just ripped off 22 wins in a row from Games 65-86. The big thing here is that the streak covered the entire 3-week stretch of divisional play and South Park moved from 5 games down and in 3rd place to leading the division by 10 games. By the way, Tom broke the record of 21 games set in 2011 by...the South Park Butters. Just missing this year...in Bronx Bombers, Chicago (owned by Michael Quinn) won 20 in a row between Games 66-85. For Weeks 16-20, the lineup/transaction deadline shifts to SUNDAY nights. Checking your potential for running out of cash now includes any contract extensions you submitted. A bug with guys on IR was fixed. Previously, dropping a guy on IR made it look like you were freeing up a roster space (including limits on players over 250 salary), but since the guy on IR already didn't count, that was incorrect. Effects of trades are still not tracked for possible problems - you'll need to inspect your own rosters manually to make sure it will go through. Hope to have that error-checking added in August. We've hit the halfway point of the 2012 season with Game 75. All teams received an extra 1 million BW Bucks this week. One more cash distribution during the last transaction session in July. Starting this week - lineups and transactions are due on MONDAY nights. First round draft picks for 2012 are now in the player list. Potential hole in the transaction error-checking process. It may not calculate roster limits correctly if you're cutting someone who's currently on IR. Players on IR are already not counted against any of your roster limits and the process may be giving "extra credit" now when you're cutting someone on IR. MLB Amateur Draft - One of three ways that players get added to the BWB player list is when selected in the first round of the draft. With the draft coming up on Monday, when can you expect to see the new prospects show up? Players will show up for the first time after the Week 10 Transactions/Lineups are processed (deadline Tuesday, June 12 - expect posting on Wednesday or Thursday). So the first transaction period to sign them will be the Week 11 Transactions - with a deadline of Monday, June 18 (see transaction schedule). Transaction order will be based on the standings at the end of Week 9. These are planned dates. Circumstances may arise that delay this an extra week. All teams received an extra 1 million bucks this week. You'll get two more cash distributions - one at the end of June and one at the end of July. NEW!!! : Transaction error-checking now includes potential errors you might run into with roster sizes and limits and running out of cash. It does not yet include any roster/cash changes as a result of trades or contract extensions, but should be a help for many of you. It may not be perfect - so let me know if you find any situations where it doesn't seem to calculate correctly. NOTE THE DAY SHIFT: Transactions for Weeks 6-10 are due on Tuesdays. Have you been hanging on to guys on IR but don't really intend to keep them for 2013? Or waiting to see if some guys start performing in 2012? Week 5 marks the last where you get 80% of salary rebated. After Wednesday's submission, rebates start decreasing 4% each week. Getting closer to a better warning system for transactions that may put you in violation of roster limits and/or not enough cash to sign players. As a first step to that, the salary rebates on your transaction submission page and your listing of transactions for all your teams should now correctly reflect multi-season contracts. Payment was due on Week 1 deadline - April 11 - BWB delayed implementing restrictions, but if you're not paid by Week 3 deadline (April 25) - this means confirmed...including checks received - you will be locked out from adds/drops/trades (you'll be OK for this week - restrictions will start with Week 4 submissions). You'll be locked from lineup changes if not received by Week 5. If you're running multiple teams (or want to increase your number), check out our multi-team packages. Should have reminded you before transactions this week, but we run 2 weeks behind in applying standings to transactions. Once we complete Week 1, those week-ending standings will determine the Week 3 transaction order. And the revenue for games won and division position for Week 1 get applied during the Week 3 transactions. Working on some web code to help you out with roster/cash limitations when you try to sign and trade players, but that's a complicated mess, so it will come eventually...in the meantime, make sure you're checking your rosters - and the limits posted beneath your rosters - as you submit transactions or you may miss out on some players you need. No new players added yet - see the note below from March 22. Transaction order will be reset to the reverse of 2011 standings (or team total salary for new leagues) for the Week One transactions (due April 11). You don't have to have a lineup set until April 11, but it doesn't hurt to start setting it now. Firemen League Draft Central - Startup Draft - Phase Two Complete. League will start now with free agent transactions with the Week Zero submission (Saturday 4/7). Superman League Draft Central - Startup Draft - Phase Two Complete. League will start now with free agent transactions with the Week Zero submission (Saturday 4/7). They Might be Giants Draft Central - Startup Draft - Phase Two Complete. League will start now with free agent transactions with the Week Zero submission (Saturday 4/7). Our Week Zero deadline is Sat April 7 and Week One (when BWB Opening Day lineups are due) is Wed. April 11. Expect that the Week Zero transactions will get posted on Sunday April 8. Any players who appear in MLB games for the first time on or before April 7 will get added to the player list in time for the Week One transactions. If they do not appear by that time, then they'll likely be available for the Week Two submission (due 4/18). So...if Yu Darvish pitches for Texas in either of their first 2 games, look for him between 4/8-4/11 to add him to your roster...otherwise it won't be until Week 2. Any players who appear for the first time in the Japan games between Oakland and Seattle (Yoenis Cespedes anyone?) will not be available until the Week One transactions. Week 1 & 2 transaction order is in reverse order of 2011 standings - the same as was the case for the Redistribution Draft (new leagues are in reverse order of total team salary after Week Zero). Starting with Week 3 we look at 2012 win-loss records to set the order. Superman League Draft Central - Resolution of contested picks complete...Phase One is done - players are now on your rosters and each team received an extra 10 million in cash - we now move on to Phase 2, with your first set of picks (10 rounds) due THURSDAY night 3/22 at midnight Pacific. This is fantasy baseball 365 days a year. Teams are now making adjustments to their rosters for the 2012 season. Our new 16-team leagues are full for 2012. But, would you like to attempt to turn around a struggling team?, these orphan teams are available...pick up an existing team and rebuild it, rather than start from scratch. Want to sign up for an orphan team in 2012? If you're new to BWB, you can sign up here. Existing BWB owners can pick up brand new extra teams. This link is always found on the Help Page: As you're putting together your 2012 roster, particularly if you're new to BWB you might want to check out the sample scoring page that allows you to play around with a batting order and see how it can affect your offensive score for a game. They Might be Giants Draft Central - Startup draft - Phase One - complete. The first set of Phase Two picks are due Sunday night at midnight Pacific. Multi-Team Tools. Now has a method to attempt to sign a player as a free agent for every team you own. The offseason transaction order for weekly signings is run a little differently. We do it as a kind of ongoing "waiver" wire. As you pick a player, you go to the bottom of your league's order. Because it's set manually, it will generally be updated 1-3 days after the transactions post. Contract extensions for 2013 and beyond are now open. Annual strong advice is don't use them now unless you have to...returning teams can take a maximum of 5000 cash into the season as of Week Zero. Otherwise, it's best to wait until closer to the July deadline for extensions. Payment now due - If you're brand new, you must pay before you join a league. If you joined BWB in 2011 or earlier, you must pay by Week 1 (April 11) or you will face transaction/lineup restrictions. Redistribution Draft - Full results now posted. Redistribution Draft - The draft is complete and players are now on your rosters - however, we're still redesigning how the results are posted, so there are no draft details yet. In the meantime, check out some stats about the draft submission. Weekly transactions are now open: Sign free agents, cut players, make trades. Redistribution Draft - The deadline for picking was Saturday night. It takes a while to go through everything, so we're targeting Monday, Feb. 20 for the completion of posting the results. That will make Friday, Feb. 24 the first option for submitting cuts, free agent pickups, and trades. Multi-Team Tools. Now contain a display of all your Redistribution Draft lists on one page. Multi-Team Tools. Do you run teams in multiple leagues? There's a new page with a set of tools and functions with you in mind. Look for more to be added soon, but off the top there's a page that will show a rundown of all the players on all of your teams plus a method to add a player to the Redistribution Draft list for every one of your teams. Drops processed for returning leagues. Redistribution Draft - picks will be due on Friday Feb. 10. Returning Leagues - Player cuts...getting close - one more night. Look for cuts to be posted Thursday night. The schedule for submitting Redistribution Draft choices will be adjusted accordingly. Look for at least 2 full weeks. One more delay -With some late-assigned orphans, and me still needing to work on rosters for the remaining orphan teams, the deadline for carryover choices is pushed back to Friday, Jan 13 (midnight Pacific). New Players - 116 new players added to the master player list based on the MLB 40-man rosters. No more additions until after the season begins.